Grapefruit – It’s loaded with vitamin C and the antioxidant lycopene, which is shown to reduce inflammation and prevent cell damage. This fruit is also an excellent source of fiber and has high water content. Pineapple – It’s packed with nutrients and an important enzyme called bromelain, which metabolizes protein, eases inflammation and decreases bloating. Plain Greek Yogurt – Provides a great source of calcium, potassium, zinc and B vitamins. The protein and probiotic cultures inside are added bonuses to help with satiety and good gut health. Coconut Oil – It’s the ideal ingredient for medium chain fatty acids, which are easily digested, burned for energy and promote blood sugar stabilization. 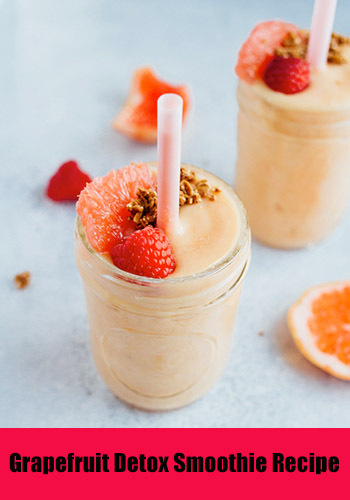 This sweet grapefruit detox smoothie is very quick and simple to make. Grapefruit brings a tangy sweetness, along with a beautiful pink hue. The pineapple will give it a creamy, thick consistency. Gather the ingredients below and follow our instructions to make your yummy smoothie now! -Use grapefruit segments! Segmenting the grapefruit removes the bitter pith and makes for a sweet and juicy smoothie without any bitter aftertaste. Segment the grapefruit over a bowl so you can catch all the fresh juice and include it in the smoothie as well! -You can serve the smoothie straight up in a glass or make smoothie bowls. I made sure the smoothie had a thick texture that would work well for smoothie bowls. 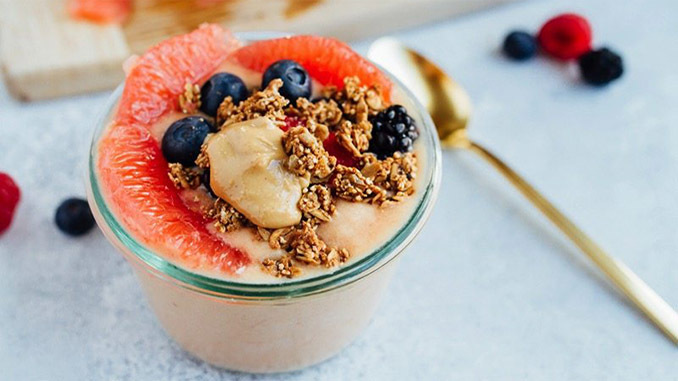 You can then top the bowls with granola, grapefruit segments, fresh berries and little almond butter! 1) Segment grapefruit over a bowl so you can collect all of the juice. Then, set 2-3 segments aside for topping. Add grapefruit segments, grapefruit juice, frozen pineapple, Greek yogurt, coconut oil and fresh ginger into a high-powered blender and blend until smooth. 2) Taste and adjust ingredients based on preference. If smoothie is too thick add some non-dairy milk. This recipe takes about 10 minutes for preparation and 10 minutes to make. Once finished you will have 2 servings so keep one stored in a cold location for a later time. Hope you enjoy!